Although the sweet pastries are delicious, the savory pastries are to die for. There are lots to choose from which are inspired by European and Asian pastries. My go-to savory pastries are the mushroom and cheese, the jalapeno danish, and the potato cheese puff pastry. Here are a few of my usual choices at 85C. 85C is the first and only place I've ever had a sea salt drink. You can get an iced coffee or an iced tea with the sea salt whipped cream on the top. It's sweet and a bit salty, yet refreshing all at the same time! Here is my Sea Salt Jasmine Iced Tea which I'm in LOVE with! The cakes are not only beautifully made, they are also super delicious! Our family loves to pick up these cakes for special occasions. 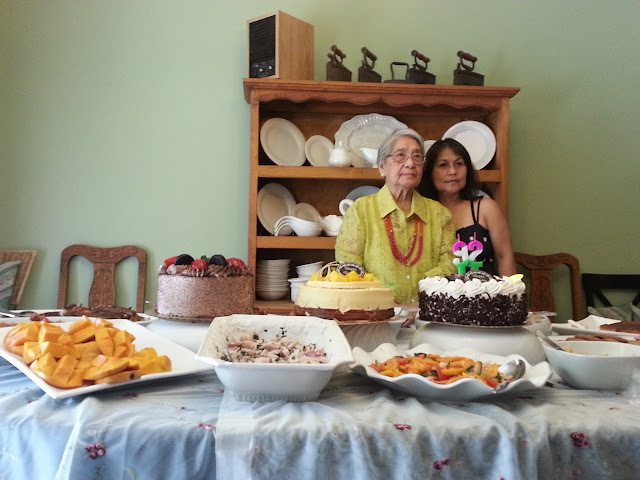 Here's my grandma and my aunt with their 85c Bakery Cafe birthday cakes. Don't they look delish? 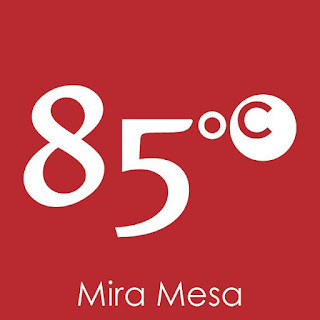 Check out 85C Bakery Cafe's website or the Mira Mesa location Facebook page for more information and details on special events! Here is my Snapchat coverage of the Grand Opening Festivities! I'm so excited I 85C Bakery Cafe is just a few minutes away from me! See you there!